Heavy wall 6” square carbon steel structural tube main frame with continuous welds. Custom monorail measures 120” from end of beam to centerline of unloader discharge. 2 ton Harrington electric hoist with motorized trolley and nylon energy chain package. 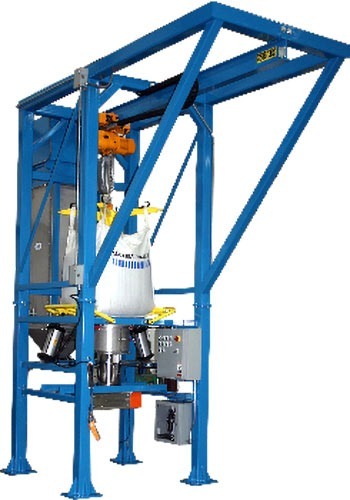 Custom Spider-Lift™ bag hanger provides maximum clearance beneath bulk bag. Flo-Master™ heavy-duty “breaker bar” bag massaging system with tubular frames promotes material flow. Stainless steel Flo-Lock™ discharge gate. 304 stainless steel Seal-Master™ bag spout access chamber with gull wing doors. 12” diameter stainless steel product discharge transition. 304 stainless steel, 12” square dual rotor lump breaker. Custom MAC dust collection system with stainless steel product contact surfaces. Hoffman NEMA 4 solenoid enclosure. Hoffman NEMA 4 system control panel.